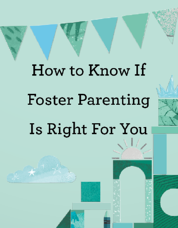 Have you ever thought about becoming a foster parent? Download this free questionnaire with important questions you should ask about yourself and your family before becoming a foster parent. Understand more about what foster care is and why it is sometimes needed to keep a child safe. Know some of the attitudes and behaviors that foster parents must demonstrate. Discern whether your personal strengths and goals may make you a great candidate for a foster parent.